Here is a window that has six panes of glass. It is three panes wide and two panes high. Can you see how many small pieces of edging I have used? The pieces of frame go around the edge of the panes, so we call them 'edging pieces'. They are all the same length and there are 17 of them. The picture on the right shows the edging pieces - there are 9 green pieces going across and 8 blue pieces going up. Explore other rectangular windows which are one window pane wider than they are high. Explore the numbers you get as you make the windows bigger. 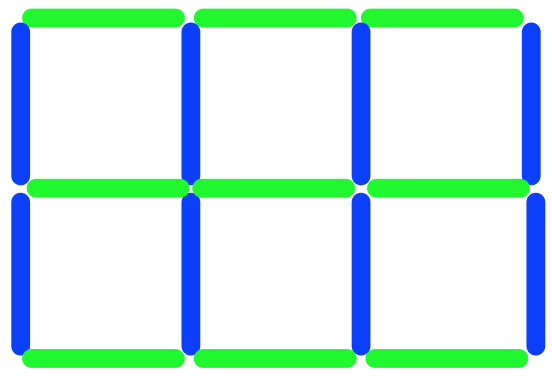 This gives us 7 inside blue pieces and 10 surrounding green pieces, making 17 altogether. 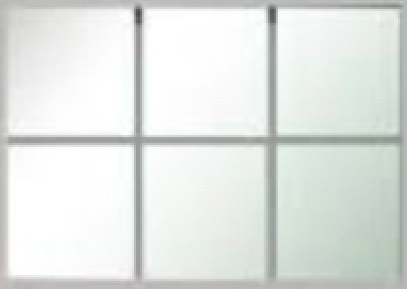 Have another look at the rectangular windows from Challenge 1, which are one window pane wider than they are high. What numbers can you get for the inside and surrounding pieces? 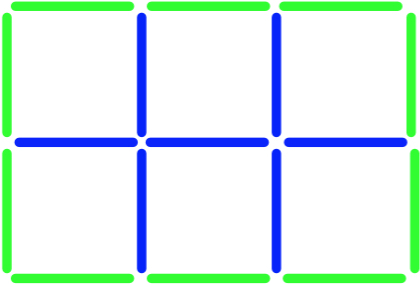 Using the numbers you've got from exploring rectangular windows (that are one wider than they are high), what things can you find out about those numbers? Below you can see how others started exploring. Louis thought of using sloping lines to cut across the windows and help him count the edging pieces. Here's a bit of his picture which so far shows that he has 2 green and 4 blue edging pieces. Freya thought of dividing each of the numbers she had got by 6 and seeing what she had left over. She worked out that 17 divided by 6 is 3, and there is 1 left over. Petros compared the number of panes in the whole window with the number of edging pieces needed. Kia looked for small squares where each one was made of 4 edging pieces. She coloured these small squares blue, and she coloured the leftover ones red. Addition & subtraction. Visualising. Working systematically. Mathematical reasoning & proof. Interactivities. Selecting and using information. Creating and manipulating expressions and formulae. Generalising. Games. Curious.